Los Endos – Ultimate Genesis are proud to play for the third time at the Mill Arts Centre and are bringing along an awesome set of the very best songs from Genesis’ 70’s repertoire. 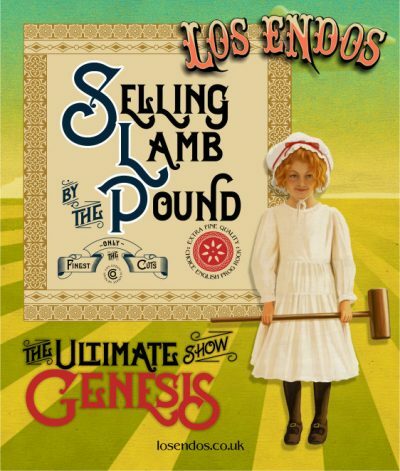 And for 2019 we are basing the show around ‘Selling Lamb by the Pound’ – with extended suites from the amazing ‘Lamb Lies Down on Broadway’ album interspersed with material from all the other great albums. Or, chunks of Lamb simmering in a rich gravy of Prog Rock! The band have been together for over 10 years, painstakingly perfecting the craft of re-creating this amazing music for their growing fan base. We feel privileged to keep this incredible music the way it is supposed to be enjoyed – played live. Come and share the experience and keep Prog Rock Live! When can I see the only performance of Los Endos: Ultimate Genesis?